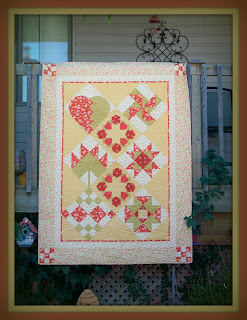 This is the sample I made for the beginners class at Kindred Spirit Quilt Co. I taught a lovely group of students this project over a 6 week period and they all did amazing. The quilt is from It's Elementary by Eleanor Burns. The students made a slightly smaller quilt with just 5 blocks as apposed to my 8. I had extra fabric left that was enough to squeeze out a couple more. Their quilts were a very nice table top size. I was amazed to see the progress they all made and how wonderful each and every one turned out.